V.J Village. This luxury pool villa is located along Soi Siam Country Club, just 10-15 minutes from the centre of Pattaya City, or local beaches. Also within walking distance of the Mabprachan lake, which is now becoming a very popular area to eat drink, and relax with many open air European and Thai restaurants, golf themed English pubs, all with plenty of space for children to play. This house has been completely renovated by the owner, replacing almost everything from the original house. 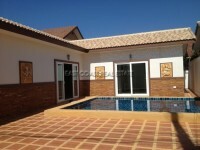 Sat on 328 sq.m of land the house offers 3 bedrooms, large living room, European fitted kitchen, and private swimming pool.